The residential property market in Durban North has continued to grow as the average value of homes sold in this area has steadily risen since 2009. Recent statistics indicate that the average selling prices of freehold homes and sectional title properties have increased to around R3 million and above. This is largely due to the sought-after, safe suburban life that many homebuyers, particularly in the middle to high income bracket, are looking for. Durban North has become a standalone live, work and play lifestyle hub. The vibrant suburb of Broadway has emerged as a commercial and entertainment hub with many restaurants and retail options available – while the trendy Mackeurtan Avenue has become a food lover’s dream with numerous charming, unique eateries and restaurants on offer. Predominantly this area has been attracting family buyers, seeking spacious properties in a quality locale – with approximately 56.5% of recent buyers falling between the ages of 36 and 49. Families are also drawn to Durban North for the excellent educational institutions and prestigious schools in the area, these include; Varsity College, Durban North Primary School, Our Lady Of Fatima Dominican Convent School and Northlands Girls' High School. Other factors contributing to the demand in Durban North is the convenient location it offers, in close proximity to Durban, Umhlanga and Ballito – Durban North offers residents easy access to great swimming beaches and a myriad of exciting activities like the Gateway Theatre of Shopping. Durban North homes range from modern sectional titles to grand mansions and everything in between. A four bedroom abode can still be obtained for under R3 million, while most of the market’s activity can be observed in properties listed between R2.5 and R7 million - as higher-income buyers see the value of investing in this suburb. Competitively priced homes will generally sell within a few days of listing, especially in upper Durban North suburbs like La Lucia and Glen Ashley. Accommodation is however becoming limited as new residential developments have become less frequent – causing the demand to outmatch the supply. 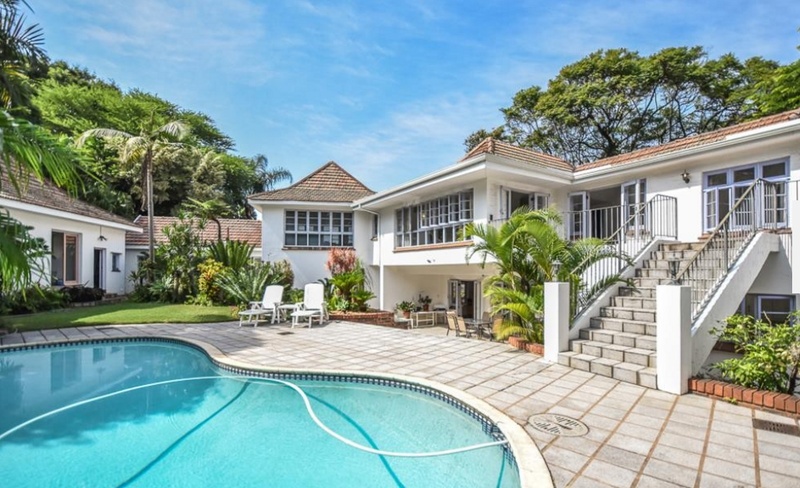 Currently on the market is a lavish four bedroom home in the heart of Durban North listed at R6 395 000. This stately home boasts spacious living spaces including a beautiful entrance hall that leads into an open lounge, dining room and library. The gourmet built in kitchen has been topped off with stunning finishes and leads out onto the patio and braai area that overlooks the sparkling pool. Upstairs you will find a pyjama lounge and four luxurious bedrooms with built in cupboards, air-conditioning and stunning views. Additional features include; a nursery, a manicured garden, two-room soundproof cottage, full security and a total of four garages. If you are seeking a family home in the safe and well-located Durban North area, the time to act is now. Dormehl Phalane Property Group offer homebuyers a wide range of homes and property types in the Durban North area. Contact our dedicated team today to view one or more of these stunning homes.